Local nonequilibrium model of dendritic solidification in a binary alloy [P.K. Galenko, D.A. Danilov, Local nonequilibrium effect on rapid dendritic growth in binary alloy melt. Phys. Lett. A, 235 271–280 (1997); Model for free dendritic alloy growth under interfacial and bulk phase nonequilibrium conditions. Journal of Crystal Growth, 197 992–1002 (1999)] predicts the behaviour of tip velocity in a whole range of undercooling. The model predicts the behaviour of dendritic growth at slow velocities and low undercooling, a steep rise of experimentally observed velocities with the critical undercooling ΔT*, and the abrupt change in dendritic growth mechanism with V=VD (see Fig. 1). The comparison of the LNSM predictions with the experimental data allows one to conclude that at V=VD the complete transition from chemically and thermally controlled growth to thermally and kinetically controlled growth leads to a sharp change in the behaviour of the dendrite growth velocity. Thus when the complete solute trapping occurs and diffusionless solidification begins at V=VD, the abrupt change from a power law to the linear law of dendritic growth proceeds in the alloy (Fig. 1). Figure 1. Dendritic growth velocity as a function of undercooling. Data points are obtained for Ni-Cu alloy as described in [R. Willnecker, D.M. Herlach and B. Feuerbacher, Grain-Refinement Induced by a Critical Crystal-Growth Velocity in Undercooled Melts, Appl. Phys. Lett. 56(4), 324-326 (1990)]. Red and green curves are given by LCT-BCT-model [J. Lipton, W. Kurz, and R. Trivedi, Rapid Dendrite Growth in Undercooled Alloys, Acta Metall. 35(4), 957-964 (1987); W.J. Boettinger, S.R. Coriell and R. Trivedi, Application of Dendritic Growth Theory to the Interpretation of Rapid Solidification Microstructures, in: Rapid Solidification Processing: Principles and Technologies IV, (Claitor's, Baton Rouge Louisiana, 1988, Eds. R. Mehrabian and P.A. Parrish) pp. 13-31]. The blue curve is given by the LNSM (see for details: [P.K. Galenko, D.A. Danilov, Local nonequilibrium effect on rapid dendritic growth in binary alloy melt. Phys. Lett. A, 235 271-280 (1997); Model for free dendritic alloy growth under interfacial and bulk phase nonequilibrium conditions. Journal of Crystal Growth, 197 992-1002 (1999)]). New measurements of dendritic growth velocity in levitated undercooled nickel samples were performed as a function of undercooling ΔT to investigate dendritic solidifcation of a pure nickel [O. Funke, G. Phanikumar, P.K. Galenko, L. Chernova, S. Reutzel, M. Kolbe and D.M. Herlach, Dendrite growth velocity in levitated undercooled nickel melts. Journal of Crystal Growth, 297(1) 211-222 (2006)]. 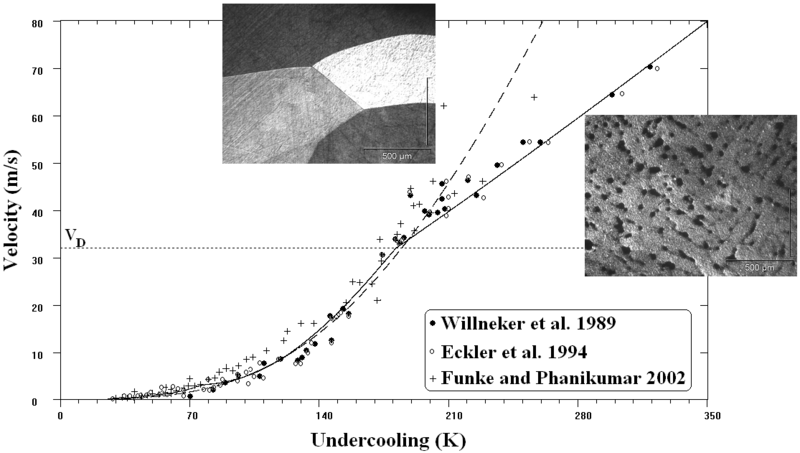 Solidification of the undercooled melt was detected at undercooling levels within the range of 30 K < ΔT < 300 K. These data were verified by the new CPS data dendrite growth velocity and also measured by using a high-speed camera where the morphology of the intersection of the solidification front with the sample surface was investigated. The new experimental data are analyzed within the model of dendrite growth obtained on the basis of Brener's theory [E. Brener, J. Cryst. Growth 99 (1990) 165] and the model of dendrite growth with melt convection in a solidifying levitated drop [D.M. Herlach, P.K. Galenko, Rapid Solidification: In situ diagnostics and theoretical modelling. Materials Science and Engineering A, 449-451 34-41 (2007)]. Special attention is paid to the effects of convection and small amounts of impurities on the growth dynamics at small undercoolings. Particularly, it is shown that the tiny amount of impurity may drastically change the growth velocity: at large undercooling the curve may drastically shifted from the predicted curve for the pure system (see Fig. 2). Figure 2. Comparison of sharp interface theory with experiment in "nominally" pure Ni. Experimental data are taken from [R. Willnecker, D.M. Herlach and B. Feuerbacher, Phys. Rev. Lett. 62 (1989) 2707; K. Eckler, D.M. Herlach, Mat. Sci. Eng. A 178 (1994) 159]. Solid curve predicts the growth of "nominally" pure nickel with the amount of 0.1 at.% of impurity and with the microstructure shown on the right side of the figure. Dashed curve predicts the growth of "nominally" pure nickel with the amount of 0.01 at.% of impurity and with the microstructure shown on the top left side of the figure. Numerous experimental data on the rapid solidification of binary systems exhibit the formation of metastable solid phases with the initial (nominal) chemical composition. This fact is explained by complete solute trapping leading to diffusionless (chemically partitionless) solidification at a finite growth velocity of crystals. Analytical treatments, using the LNSM, lead to the condition for complete solute trapping which directly follows from the analysis of the solute diffusion around the solid-liquid interface and atomic attachment and detachment at the interface [P. Galenko, Solute trapping and a transition to diffusionless phase transformation in binary systems. Physical Review E, 76 031606-1-9 (2007)]. The resulting equations for the flux balance at the interface take into account two kinetic parameters: diffusion speed VDI on the interface and diffusion speed VD in bulk phases. 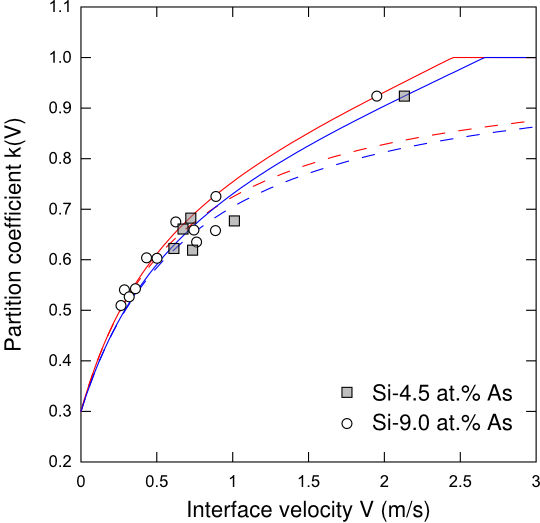 The model describes experimental data on nonequilibrium solute partitioning in solidification of Si-As alloys [M.J. Aziz et al., J. Cryst. Growth 148, 172 (1995); Acta Mater. 48, 4797 (2000)] for the whole range of solidification velocity investigated (see Fig. 3). Figure 3. Solute partitioning versus interface velocity for experimental data [J.A. Kittl, M.J. Aziz, D.P. Brunco, and M.O. Thompson, J. Cryst. Growth 148, 172 (1995); J.A. Kittl, P.G. Sanders, M.J. Aziz, D.P. Brunco, and M.O. Thompson, Acta Mater. 48, 4797 (2000)] on solidification of Si-As alloys. The dashed lines show the predictions by the CGM - Continuous Growth Model of Azis and Kaplan [M.J. Aziz and T. Kaplan, Acta Metall. 36, 2335 (1988)]). They describe experiment at small and moderate solidification velocities. The solid lines are given by the LNSM which shows ability to describe experiment in a whole region of investigated solidification velocities for both alloys. As it has been observed in experiments on solidification of a Si-As alloy (see Fig. 11 in Ref. [J.A. Kittl, P.G. Sanders, M.J. Aziz, D.P. Brunco, and M.O. Thompson, Acta Mater. 48 (2000) 4797. 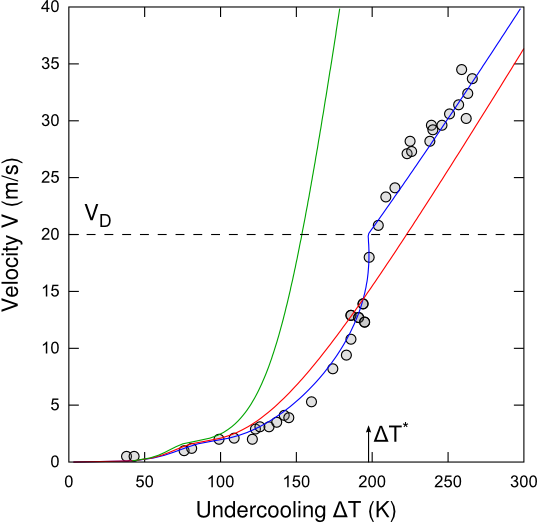 ]), at the solidification velocity below about V = 2 m/s, the interface temperature - velocity relationship exhibit a clear deviation from experimental data. This deviation has been attributed to the increasing influence of the local nonequilibrium solute diffusion around the interface at high solidification velocity [P. K. Galenko, Extended thermodynamical analysis of a motion of the solid-liquid interface in a rapidly solidifying alloy. Phys. Rev. B, 65 144103 (2002); Rapid advancing of the solid-liquid interface in undercooled alloys. Mater. Sci. Eng. A, 375-377 493-497 (2004)]. Using the LNSM, satisfactory description of experimental data in the whole range of velocities, Fig. 4, confirms the principal ability and correctness of the local nonequilibrium approach to rapid solidification. Figure 4. 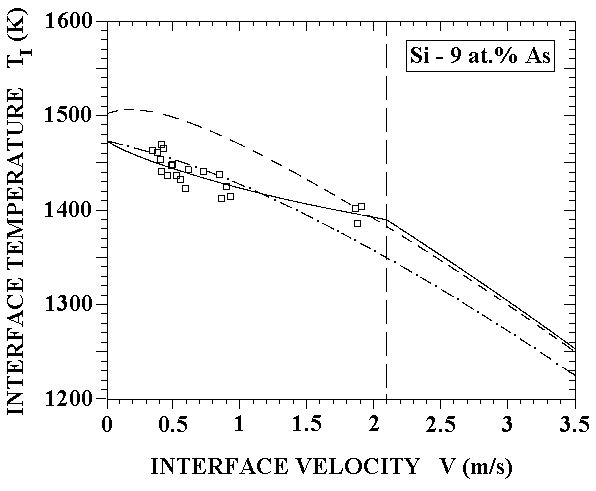 Interface temperature-velocity relationship obtained for a Si - 9 at.% As system. Dashed curve: model without solute-drag effect; dashed-dotted curve: model with solute drag; solid curve: the LNSM prediction. Data points are taken from Refs. [J.A. Kittl, M.J. Aziz, D.P. Brunco, and M.O. Thompson, Appl. Phys. Lett. 64 (1994) 2359; J.A. Kittl, P.G. Sanders, M.J. Aziz, D.P. Brunco, and M.O. Thompson, Acta Mater. 48 (2000) 4797].